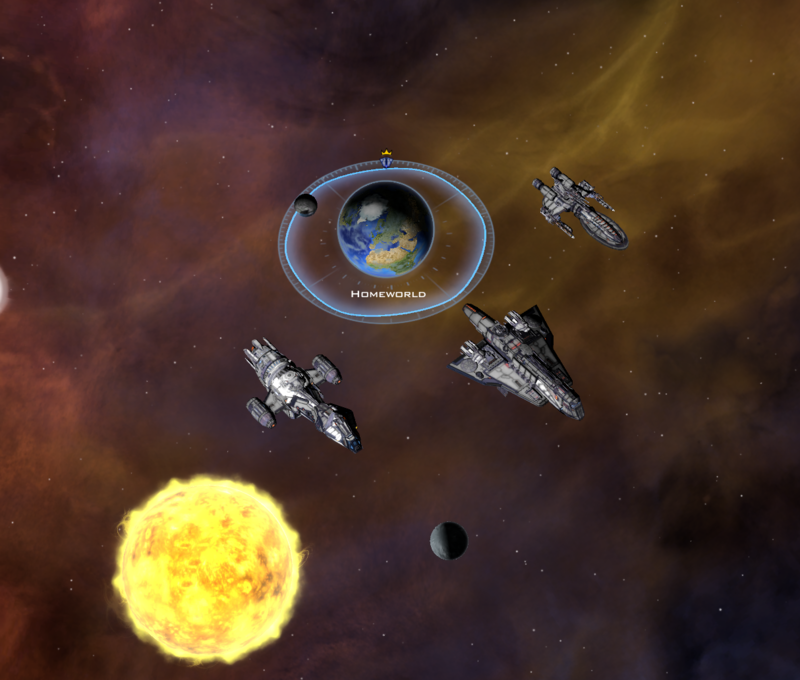 Galactic Civilizations III: Crusade is Available Today! Gets Its Biggest Expansion Ever! Crusade provides a level of strategic depth that fixes the late-game grind and gives players what they’ve been craving. Create a unique faction complete with leader, ideology, and abilities. Customize your own galactic navy and write unique conversation dialogue for your faction to use when it comes into contact with friends and enemies. Once you've perfected your people, upload your creation to the Steam Workshop for other users to enjoy! 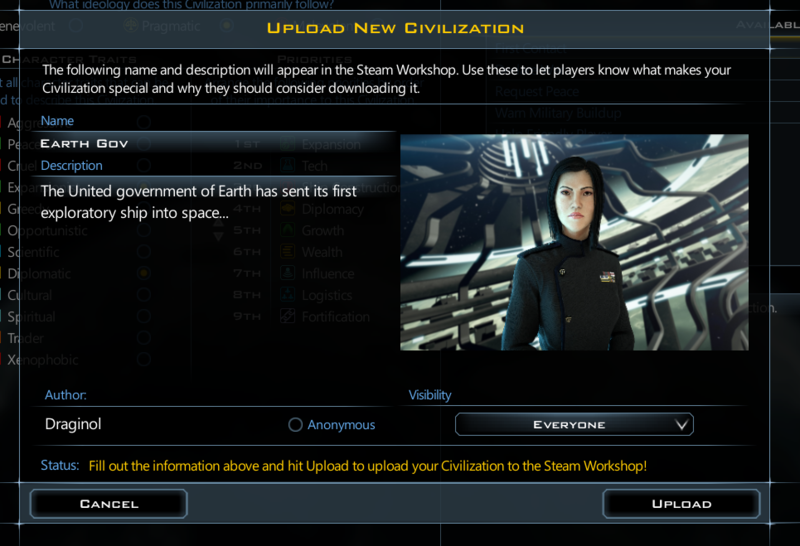 *The Civilization Builder uses Steamworks and is only available to users who purchase a copy for Steam. Shape the course of your civilization's destiny with talented individuals called citizens. Choose from over a dozen unique roles - commander, engineer, farmer, celebrity, and more - to help your colonies flourish by unlocking new gameplay or providing bonuses. 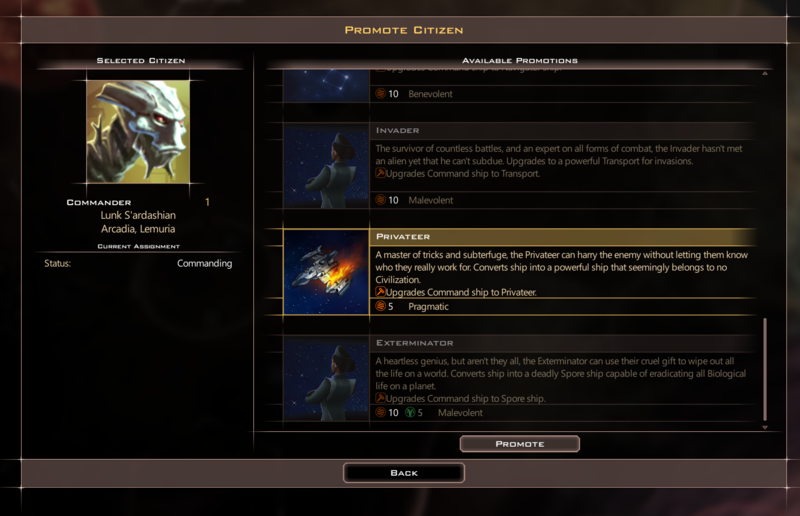 The unique Promotions system allows citizens to answer a higher calling. They become effectively "retired" in exchange for a large benefit. Commanders can become Privateers and convert their ship into a powerful vessel that belongs to no civilization and terrorizes other ships for fun, profit, and plausible deniability. Celebrities can sing their swan song in a spectacular final concert, Spies can choose to go down in a blaze of glory (and explosives!) as Saboteurs, and more. Not all wars are won with troops. Train spies to gather information from foreign worlds so that you can formulate the best strategy for conquer or trade. If your enemy starts getting a little big for their galactic britches, send your spies in to knock them down a few pegs and destroy critical planetary improvements. Steal technologies from other civilizations or use your spies to counter against agents that may have infiltrated your own worlds. Some wars are won with troops! 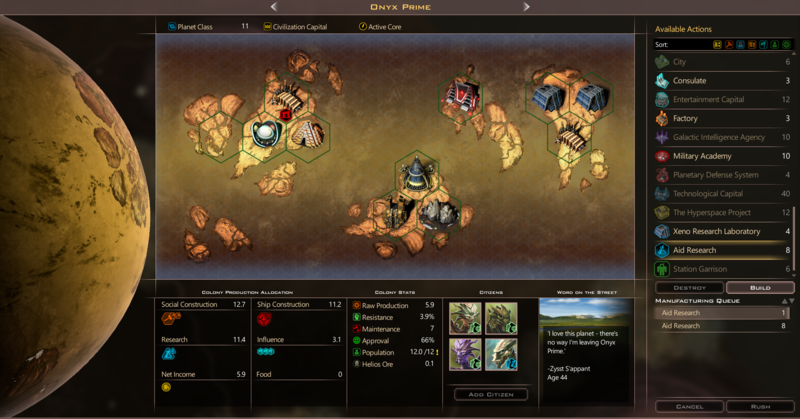 The Invasion system has been revamped to provide a greater challenge and more strategic depth. 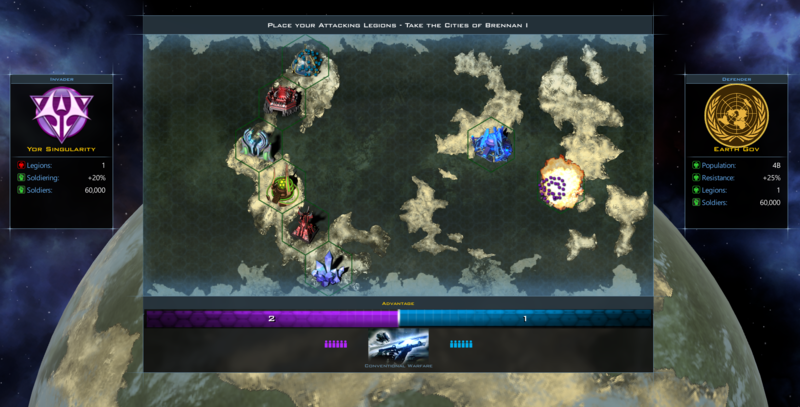 Train your legions and send them to enemy worlds, choose a landing location, and then watch planetary improvements explode into fire and ashes as your troops march across the planet's surface. Don't forget to leave a few legions at home, too - they're your best line of defense against a revenge invasion! You already know you're not alone in the universe, but there are always new civilizations to discover. Crusade features three brand-new factions: Terran Resistance: The portion of humanity that avoided being trapped on Earth behind the Precursor Shield, years on the run have made them resourceful, but hard. The Onyx Hive: These multi-limbed worms were born from the deep, volcanic vents in the ocean of their homeworld. Natural spies, their society thrives on backstabbing and intrigue. 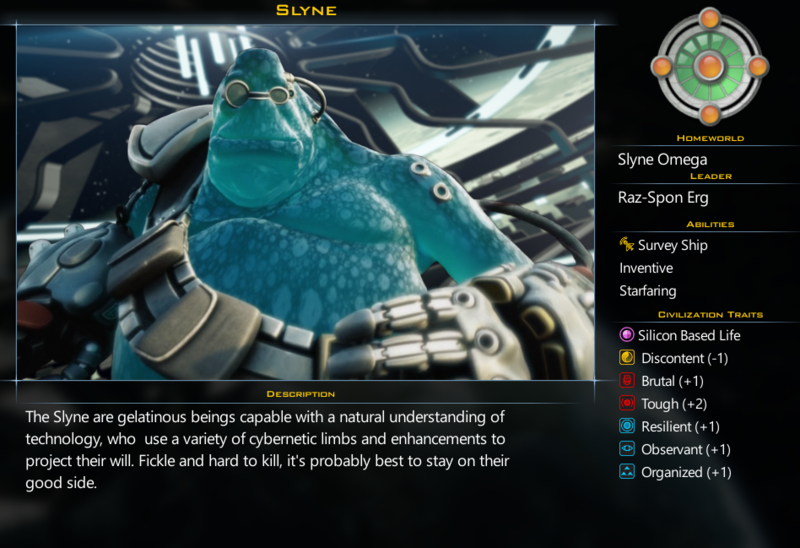 The Slyne: These cybernetic space amoebas look down on other races as being primitive. Fickle and hard to kill, it's probably best to stay on their good side. Updated Civilizations: The races you were once familiar with have been updated so that playing against them is now a more unique experience. 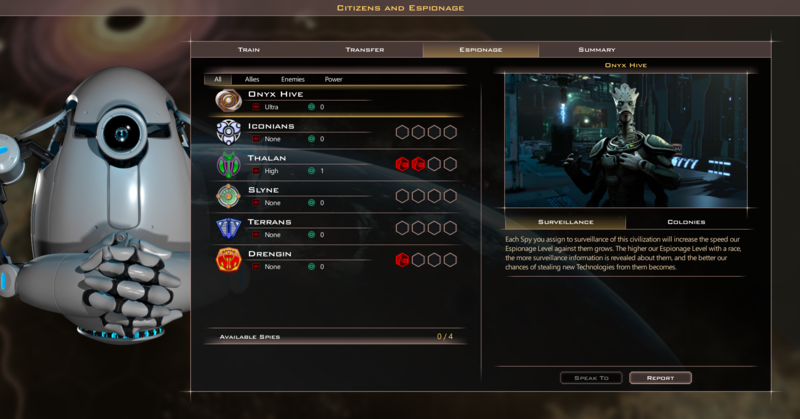 The civilization selection screen contains lots of new information on each race so that you can make the best decision about who you'd like to play against. Updated Economy: Each decision you make matters - a lot. Raw production increases if your population is large and your people are happy. Raw production value also influences things like research, construction, and wealth. Updated Diplomacy and Alliances: Interactions with other races are now weighed more heavily than before. Be careful who you upset - no one in the galaxy likes a civilization of warmongers. When trading, a "fairness" bar at the top of the trade window shows you how much more (or less!) you need to offer before the trade is even. New flavor text unique to each race makes trading a fun and unique experience! Missions: Subsidize ventures to the depths of the galaxy to search for resources, abandoned ships, or ancient technologies. Starbase Mechanics: Starbases are now upgraded at the starbase itself rather that having to rely on distance plants to send additional constructors. New UI: A sleek new UI brings important details to the forefront and emphasizes functionality. 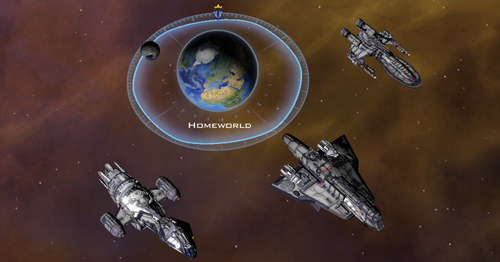 Get Galactic Civilizations III: Crusade at Stardock or on Steam today! Lost Treasures | Altarian Prophecy | See the rest here! +1, patiently waiting for the gog release. In my experience, it is GoG itself that is usually responsible for the delays. Edit: GOG doesn't even have a page up yet for it, which means it can't be linked in the hot-off-the-press 1pm post, which makes it look like Stardock is ignoring GOG, when the reality is quite the opposite. Gronk. I've figured out how to move my designs across but i have no idea how to build a factory. Edit: Well, now I'm ready to play, but is of course tired and need to hit the sack. But the micromanagement support is outstanding, given that I have used 5 hours to set up the game, with individual ships and other exploratory adventures, before even getting there. Hehe. now survey ships are not needed! so why do you now need survey ships? answer - there is no need for them! You are wrong, especially because new anomalies spawn during the game. You are wrong. Ship Graveyards are still there, there are anomalies that reward research point and resources, like Thulium. You are wrong. The artifact to finish a research is still there. Is is much rarer, but it is still there. You are wrong. The rewards from Space Junk are 1, 10-50, 100. That is your opinion. And I do not agree with it. It is called a trade-off. Yes, this is my opinion based on 3 games played in the Crusades, with hundreds of artifacts found. I am very dissatisfied with the reduction of prizes in the artifacts. You try to play at higher difficulty levels, not on easy and normal, maybe then you will understand my opinion. update. developers, are you crazy? Ysengard MUST collect 100bc for each artefact, trash etc., and his collect instead 100 only 25! It is comes boring. good luck, I quit.